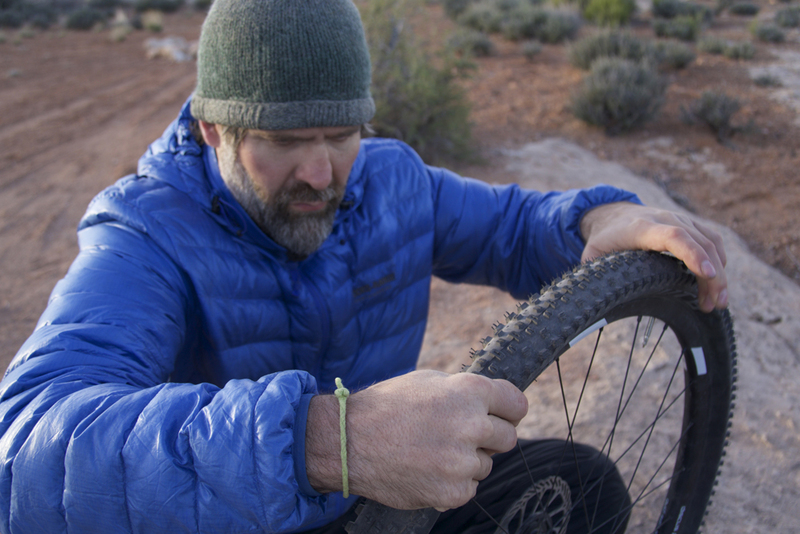 We asked our favorite bike mechanic what to bring and what to know before departing on a bikepacking adventure. Getting ready for a bikepacking race can take hundreds of hours. You have to build a foundation of fitness, dial in gear, and create a proper hydration and nutrition strategy. But the trail doesn’t care how much you prepare, and neither does the bike. Mechanical failure can happen to anyone. However, you can overcome this obstacle with a little knowledge and creativity. 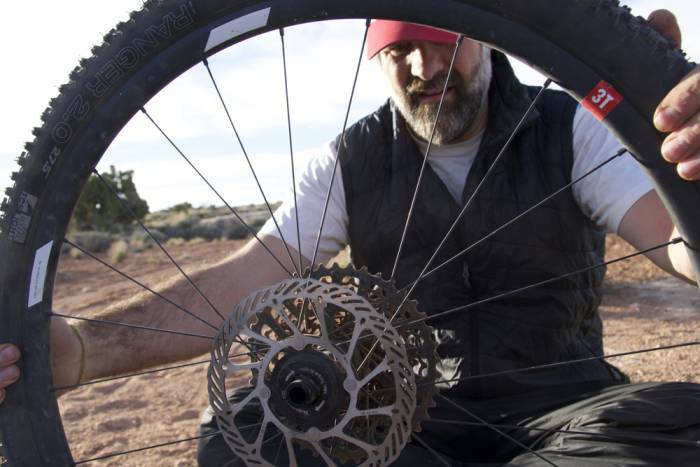 Boise-based Jason Bauer, the owner of Bauerhaus Bikes, is a mechanic’s mechanic. He’s my mechanic. 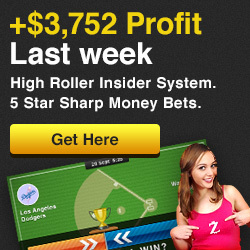 But he’s also the tooling force behind seven-time world champion Rebecca Rusch. When Rebecca three-peated the 24 Hours of Adrenalin Solo Worlds, she chose Bauer as her personal mechanic. When Rebecca won Leadville four times in a row? Jason was there. When Rebecca rode the Ho Chi Minh Trail? Yup, Bauer pedaled along, keeping the rigs in tip-top jungle shape. With my first bikepacking race one day away, I sat down with Bauer to get schooled on how to keep the bike trail ready over 400 miles alone on the gravel road. The tires are the first point of contact with the ground and thus have the most exposure to potential roadside hazards. So Bauer recommends beefing up your kit around overall tire health. Bauer is a big fan of running tires tubeless. Tubeless tires have less rotational weight (requiring less energy to spin) and can be run at lower pressure. And though they require a (messy) sealant, this actually makes tires more resistant to trail crud puncturing a tire, self-sealing smaller holes. For larger punctures (from branches or nails), Bauer recommends bringing a tubeless repair like Dynaplug, which makes trailside repairs a quick, easy, and clean. 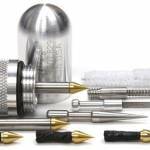 Tubeless tire repairs can be quick and easy with new tire plugs. As a backup, Bauer recommends bringing two sets of appropriate sized tubes. “If you only bring one spare and end up using it, you’ll only worry that the last one won’t be enough.” It wouldn’t hurt to bring a traditional tire repair kit, either. If running tubeless, bring spare valve. And always bring a set of tire levers and a tire pump. Of course, bolts hold the bike together. But the perpetual rattle-and-hum of the trail can wear down the bolt integrity. Give the bike a once over and make a collection of spare bolts that fit the bike. Many accessory bolts on a bike are universal (often 5 mm). I’ve personally had to borrow a bottle cage bolt to replace a failing seat rail clamp to finish out a century ride. 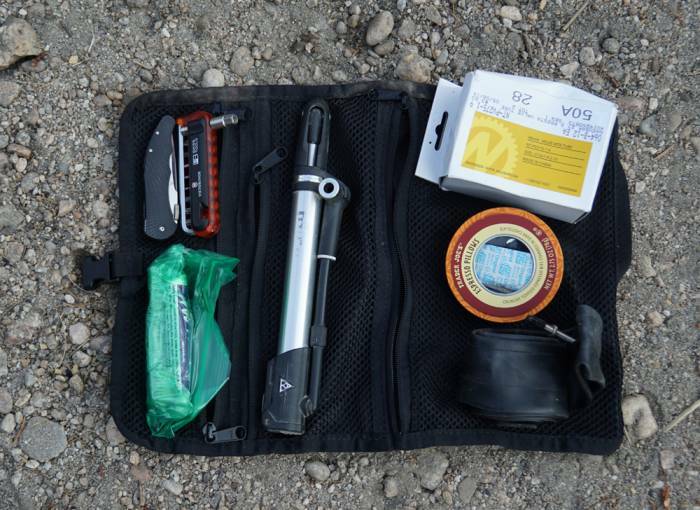 Every rider should have a multitool in their repair kit. 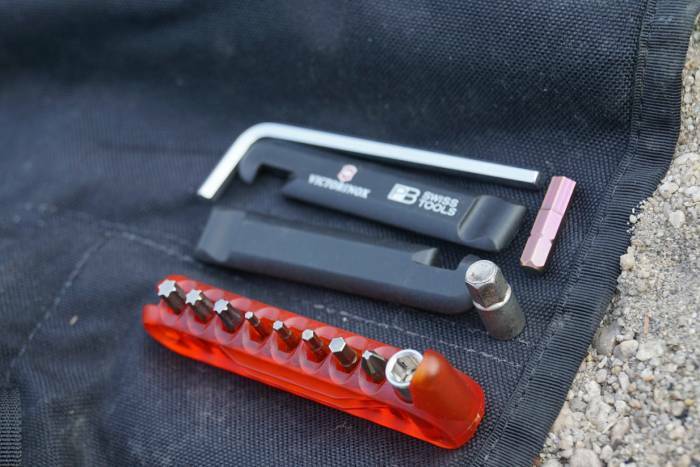 A good multitool should include a variety of hex wrenches sized 2 to 8, a Phillips and flat screwdriver head, a chain breaker, and potentially a T25 Torx. I’m personally a big fan of the Swiss army bike tool. With its interchangeable tooltips and sidewall tire levers, it packs down small. The full-size Allen makes it easy to work on the bike and adds a little extra leverage than a traditional folding multitool. A Leatherman and a small channel lock wrench can be invaluable for repairs both on and off the bike. Pedals are mostly bomber, but, if neglected, grease can get gritty and the bearings can wear down. If you’re running clipless pedals keep them clean and maybe rebuild them once or twice in their life. Bikepacking can have you in and out of the saddle, huffing the bike up hills and through rivers, potentially losing a cleat. It wouldn’t hurt to toss a spare cleat and pair of bolts in your bolt bag. Like duct tape but thicker and stronger, Gorilla Tape has infinite uses. Seatpost slips? Tape it up. Lost a glove? Tape it up. Water bottle cage rattling? Tape it up. Just don’t bring the whole roll (that would be a noob move). Instead, wrap a 10-foot swath of tape around your tire pump. Zip ties are the bailing wire of cycling. What duct tape won’t fix, zip ties have it covered. Zip ties can tie a shoe, isolate a hole in an inner tube, bolt a missing chainring, strap gear, tie down a light, and more. You get the idea: They attach stuff. Bring some. It doesn’t take much to tip a bike. Loaded with bags, precariously leaned up against a fence, or turned upside-down during a tire repair, falls are the main culprits of bent rear derailleurs. A spare hanger can flip a catastrophe into pressing on in a few spare minutes. For modern bikes, I also like to carry a spare thru axle. A long day in the saddle can be rough on the chain. Bring an old toothbrush to give it a rub down and oil it up with some chain lubricant. Didn’t bring any? I know riders who have used sunblock in a pinch. Chains are messy, a rag helps you clean up afterward. Wrapping tools in the rag can also help reduce the rattle of metal on metal in your repair kit. And if your multitool doesn’t have a chain breaker, bring one of those too, along with an extra set of links to repair the chain. Finally, a clean bike is a healthy bike. 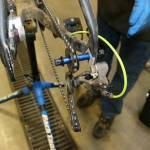 Stay ahead of catastrophic mechanicals by cleaning and inspecting the bike regularly. And if you aren’t mechanically inclined, run it by your favorite mechanic for a regular checkup. They can keep the cables fresh, the breaks adjusted, and the gears spinning smoothly so you don’t have to worry about it while on the course. The post Bikepacking Hacks: Tooling Up for Backcountry Adventure appeared first on GearJunkie.